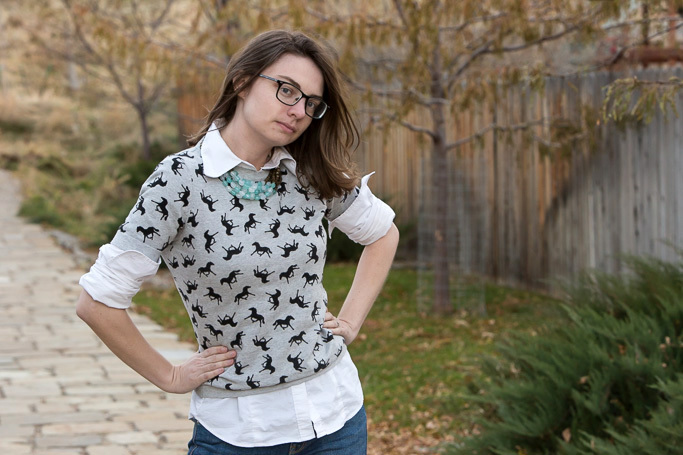 After spotting this sweater on Jenn of Jennifheish (see her posts here and here; so stylish! ), the irony was not lost on me that this was a horse print being worn by a girl living in New York City. Can you get any more urban than that? And here I was, probably the most polar opposite you can get while still being in the United States; I live in Wyoming. I mean, the entire state is barely over 500,000 people. Instead, it is all about wide, open spaces, telling people to cowboy up*, and, you guessed it- horses. I wanted to get that sweater out here and give it a real Western Twist. While Jenn was kind enough to lend it out to me, I'd forgotten one BIG thing. Horses? Me? I've never even ridden a horse (well, if you don't count riding when too young to remember it). Besides that, I don't really do the fashionable cowgirl look either with its bejeweled everything, tight jeans and black cowboy hats. Or traditional Western with boleros, prairie skirts, and decorative fringes come to that. What I do do though, is classic. So here's a slightly preppy look with a collared shirt and a few bright pops of color. Giddy-up, y'all! *Along the sentiments of "when the going gets tough, the tough get going," it's another way of saying put on your big girl/boy pants and deal with it and/or don't whine about the pain and get to work. Love how you styled this print in more of a "Ralph Lauren" western way then the "fashionable cowgirl" look with bling haha! You look super cute and classy here and as always,love the pop of red from your shoes! This is classic with a twist : ) Simple lines etc but the horse motif adds a sense of whimsy. I love it! PS Just so you know, I wanted to check out your blog, but the privacy settings wouldn't let me. I love this! For some reason I always look so lumpy when I try putting a button up on under a sweater...you pull it off wonderfully! haha love that you wanted to give it a western feel and then realized you don't dress western. Me either, and I live in Utah :) Love what you came up with though! Such a cutie. I love this simple and chic styling with your red shoes! a) I love that you girls borrowed clothes from miles and miles away! and b) i love the pop of red you used, you look so cute as usual! Love this outfit! What gal doesn't have a soft spot for ponies, y'know? Love the red flats especially - must get some for m'self someday ;)! 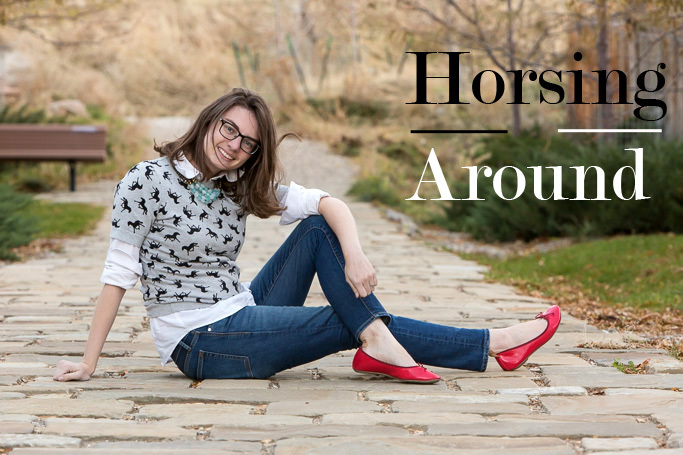 This top is adorable over a button-up, love the pop of red in the flats too! I enjoy learning more about Wyoming than I have ever known via your blog. I'm also kinda terrified of horses- I loved (like, an embarrassing amount) the movie Flicka and dream of riding horses, but the few interactions I have had with them have scared me. They're just plain old huge and always seem to dislike me! So this top is about as close as I would get also. You definitely do classic well, that's for sure! Love how you styled Jen's top. 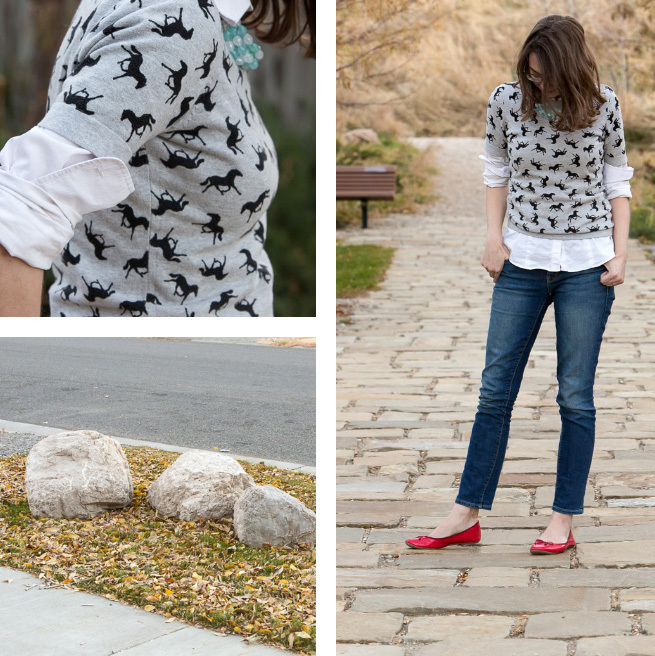 The button down underneath is perfect with it, and of course I'm loving those red flats! I love that you styled this shirt classic. Neutral with a pop of red and a pop of blue, can't get better than that combo! Omg that sweater! So cute <3 I have a love/hate relationship with animal prints right now. Completely one-sided, mind you. I don't know what they have against me, really. ;) Hehe. I'll win them over soon enough.